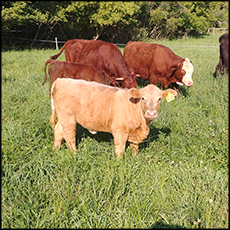 Our beef is 100% grass fed and grass finished. 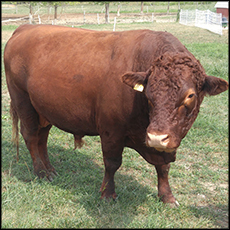 We raise our beef according to the guidelines from the American Grass Fed Association. This means our cattle eat grass and forbs on pasture or as hay when pasture isn’t available and never get any grain or soy. Grass fed beef is more flavorful and more nutritious than grain fed beef while maintaining a high standard of tenderness, juiciness and quality. We also don’t use hormones, antibiotics or any other medication for any of our animals. Our beef is dry aged for two weeks for premium quality. We have grass fed ground beef, stew beef, steaks, roasts, soup bones and organ meats in stock and ready for purchase without pre-ordering — but the best value is to purchase a share (1/4, 1/2, etc.). We have shares of beef available year-round. Generally we run about three to four months out but occasionally the wait is shorter. 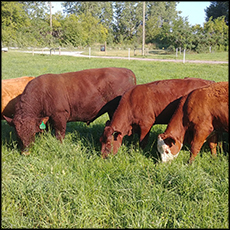 Grass fed beef is higher in vitamin E, vitamin A, vitamin B (thiamin and riboflavin), omega 3 fatty acids, beta-carotene, antioxidants, CLA (conjugated linoleic acid), calcium, magnesium, potassium and other nutrients and minerals than grain fed beef. With grass fed you get more meat per pound because you aren’t paying for as much fat that will be trimmed or cooked off. We regularly get 70% or more of the hanging weight in cuts of beef for the freezer compared to conventionally raised beef that is usually around 55% to 60%. Due to the meat being leaner, grass fed beef tastes meatier and beefier without a greasy or fatty taste. For in-stock items, please order here and let us know what you’d like — and when you’d like to pick it up at our farm in Dundee — and we’ll have it ready for you when you arrive. Click here to order online. To order a share of beef or pork, please visit our reservation page and complete the form. When we get your reservation request we’ll reserve your meat for you, send you a confirmation by email, and give you a date when your order will be ready for pick up. There is no fee for the reservation list and no deposit required. Delivery time will depend on when you place your order, what animals we have ready, and how busy the butcher is. About a month before your beef share will be ready we’ll email you an order form where you can choose how you want your beef cut up. All orders are picked up at our farm in Dundee. Unless prior arrangements have been made, orders must be picked up within two weeks of when they’re ready. All meat is vacuum packed in freezer wrap and frozen to preserve quality. Your beef will be frozen when you pick it up. It can be stored in a zero degrees or below freezer (preferably not frost free) for up to a year.